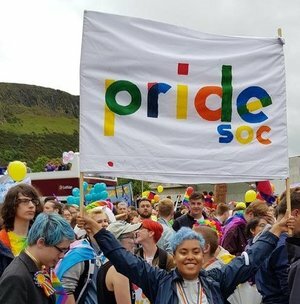 PrideSoc is the University of Edinburgh's LGBTQ+ Society. Founded in 1972, we have spent the last 45 years building a safe and inclusive space for people of all backgrounds and identities. During term time, we organise and run weekly social and welfare events, encompassing everything from nights out to baking socials to fiction discussion groups. As well as main group events, we have subgroups dedicated to specific identities, such as our Bi/Pan Group, our Trans Non-binary and Intersex group, and our Disability and Mental Health Group, to name a few. For more information on our upcoming events, subgroup meetups, and information about the Society, please visit our Facebook page . To get this info delivered straight to your inbox, feel free to sign up to the mailing list to receive the Newsletter directly! And if you have a more specific query feel free to send us an email at pridesoc.ed@gmail.com. P.S. We recently changed our name to PrideSoc from BLOGS, so some things may be in flux while the rebranding process happens. Thanks for your patience!